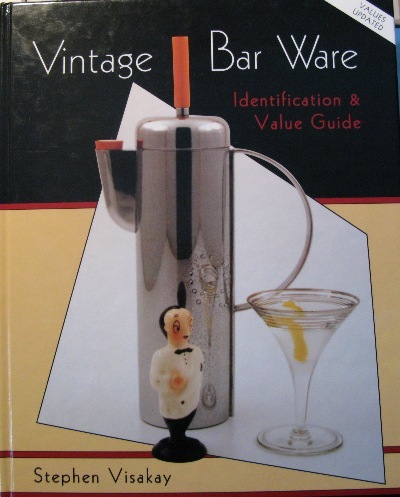 Hailed as one of America’s Top 100 Collectors, by Art & Antiques Magazine in 1996, His definitive book Vintage Bar War, an identification and value guide, Collector Books, was published in 1997. In a new book, The Business of Spirits by Noah Rothbaum, Kaplan Publishing, September 2007, Visakay is sited as a factor in the rise of today’s cocktail culture. toured the Country from 1993 to1998 with seven venues, including The Milwaukee Art Museum, The Louisiana State Museum at Jackson Square, and The Montgomery Museum of Fine Arts. The show gathered a deluge of World wide media attention at every location. His last exhibition was in The Museums at San Francisco International Airport, and was viewed by an estimated twelve thousand people every twenty four hours for eleven months. Visakay is quick to add, “whether they wanted to or not” they had to travel through the concourse to reach the terminals. Many travelers got off the people moving walkways to return to the start and view the long display on foot. One of the viewers was Stephen Gordon, Restoration Hardware’s founder and CEO, according to an interview with Southwest Airlines Spirit Magazine in 2000. “An old martini shaker caught his eye. It was functional, yet stylish…had a sense of history, a story to tell, … Besides, it was cool” He called Restoration’s in-house design team to get down to the airport pronto. A few months later Restoration issued a copy of a 1936 Penguin Cocktail Shaker, followed by a Rooster, then a Zeppelin. A whole line of barware followed. 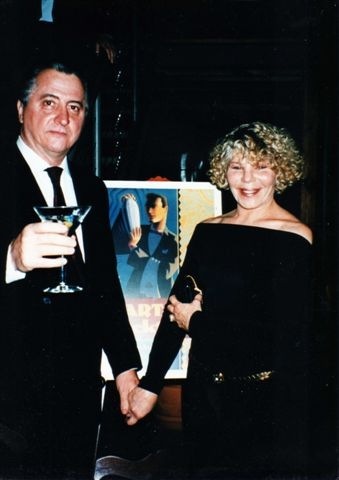 Visakay also displayed twenty cocktail shakers at the first cocktail dinner held in New York’s Rainbow Room, February 23, 1995, at the invitation of good friend Dale de Groff. Dale’s idea was innovative and unique. Instead of wine a cocktail was paired, by Dale, with each course of the special menu. The timing was perfect. As the new millennium approached there was a trend of nostalgia toward retro music, and retro culture. Retro cocktails epitomized the elegance of a bygone era. More cocktail dinners and displays of Visakay’s cocktail shakers soon followed as did prominent media attention. The zeitgeist was moving and shaking. Visakay has made many great finds in his search for cocktail shakers, and likes to tell the story of a treasure found at the Orangeburg N.Y. outdoor flea market. It was over twenty years ago on a cold June morning. Focused on a cobalt blue cocktail shaker on the seller’s table, he never saw Nyack antique dealer Arlene Lederman also reaching for it. After a brief tug of war Arlene laughingly let him buy the shaker – and treat her to breakfast. It was the start of an ongoing excellent adventure that continues to this day. The couple live happily ever after in an Arts & Crafts cottage in Upper Grandview, New York. It’s the one with the white picket fence and red roses out front. They have a nightly ritual of shaking a martini before dinner, sometimes a few. As for the cobalt blue cocktail shaker, it sits in a place of honor. Stephen never could sell it. After all, it helped him with the find and love of a life time: Arlene Lederman-Visakay. He serves as the bar ware advisor for Schroeder Publications. & various collector and antique publications.